The single-storey cottages at Champernhayes have been created from the conversion of the original farmhouse buildings, which date back to 1482. 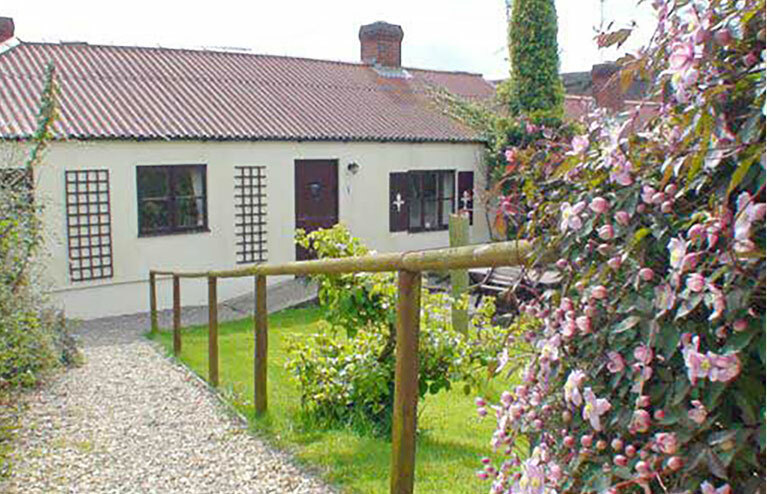 Owl cottage is situated around a central courtyard, have been awarded 4 Star Gold by Visit England. The traditional country-style kitchen is open plan, with a dining area, and comprehensively equipped. The bedrooms have their own en-suite bathrooms, and you will find your beds already made, with towels provided. Relax in your very own country retreat complete with digital television and DVD player/recorder, we can supply a selection of movies, books and board games. Each cottage has its own private garden complete with patio, hardwood garden furniture and barbeque, and the heated indoor swim spa and hot tub is available throughout the year. Excellent walks are literally right on your doorstep, along with the unspoilt Dorset/East Devon coastline. Living area with well equipped kitchen/ diner. The kitchen is fully equipped with oven, microwave, fridge, washer dryer and dish washer. Everything you need to cook, serve and clean up for full family dinner is provide you need only bring food. It has 2 x double bedroom all with en-suite facilities. There is a master double and 1 x twin rooms. The property has heating throughout in addition to the wood burner fire. Modern open plan kitchen, with dishwasher, washer-dryer, electric cooker, microwave and fridge-freezer. Open plan sitting room with coal burning stove, dining area and kitchen. The smaller, single-storey cottages at Champernhayes have been created from the conversion of the original farmhouse buildings, which date back to 1482, Blackbird cottage is the largest cottage that are , grouped around a central courtyard, have been awarded 4 Star Gold by Visit England. The traditional country-style kitchens are open plan, with a dining area, and comprehensively equipped. Most bedrooms have their own en-suite bathrooms, and you will find your beds already made, with towels provided. Relax in your very own country retreat complete with digital television and DVD player/recorder with a selection of movies, books and board games.